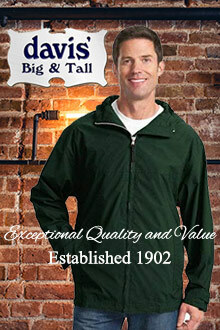 Davis' features name brand big & tall mens clothes at everyday sale prices! As long time leaders in distinctive apparel for men, they offer big and tall fashion choices you won't find anywhere else. Select comfortable jeans, tall dress slacks that look as great as they feel, dress shirts made to flatter the larger and taller man, classic suits, extended size & wide width shoes, and big and tall mens clothing for work, the outdoors, and hunting. Every item is selected to ensure that the tall and big mens clothing you select from them looks and feels right. When you want to buy big or tall man clothes that really fit, trust the company with four generations of experience. Trust Davis' Big and Tall men's store.